Krishna repeatedly comes to this world in various forms to perform specific functions. Such avatars distinguish themselves by performing extraordinary feats. They are known by references to them in the Vedas, including Srimad-Bhagavatam, which recounts histories of several prominent incarnations from the beginning of creation. 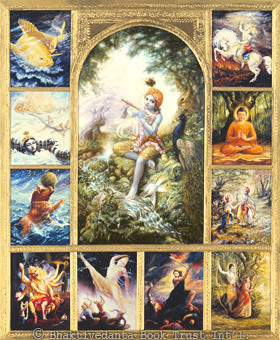 Krishna’s names, as in the Hare Krishna maha-mantra, are also considered one of His primary avatars.